Rate decision in New Zealand and in Switzerland, US Retail sales, Unemployment claims, Producer prices and Consumer sentiment are the major events for this week. Here is an outlook on the highlights coming our way. Last week, Non-Farm Payrolls posted a superb job gain of 321,000 in November. The release also showed a 0.4% rise in wages. The unemployment rate remained unchanged at 5.8%. This was the biggest jobs gain since 2012, far above average of 224,000 a month over the past year. Economists expected an expansion of 231,000 positions. This excellent release demonstrating the ongoing improvement in the job market cannot go unnoticed. The Fed will have to reexamine its zero rates policy in the coming weeks. NZ Rate decision: Wednesday, 20:00. New Zealand’s central bank maintained its Cash rate in September at 3.50%, implying they will keep monetary policy on hold until the end of next year, contrasting the U.S. Federal Reserve plans of raising rates. Low inflation and slowing global growth were the reasons behind the decision to keep rates unchanged. Rates are expected to remain unchanged. Australian Employment data: Thursday, 0:30. Australia’s job market added 24,100 jobs in October. Full-time positions expanded by 33,400 while part-time roles declined by 9,400. The jobless rate remained unchanged at a 12-year high of 6.2%, suggesting a weaker labor market amid the economy’s transition from mining-driven growth. The participation rate edged up to a seasonally adjusted 64.6% compared to 64.5% in the previous month. These figures indicate a modest improvement and a positive trend. Australia is expected to gain 15,200 jobs in November, while the unemployment rate is predicted to reach 6.3%. Switzerland rate decision: Thursday, 8:30. The Swiss National Bank kept its Libor rate at the minimum low of 0.0% to 0.25%, in line with market prediction. SNB policymakers also issued updated forecasts for growth and inflation revealing a moderate pickup in the coming months. The Central Bank expects GDP growth to reach 2% in 2015. Inflation is expected to reach 2% in 2014 and only 0.6% in 2015. Libor rate is expected to stay unchanged this time. US retail sales: Thursday, 13:30. U.S. consumers increased their spending in October, reaching $444.5 billion, on a seasonally adjusted basis, rising 0.3% compared to September’s decline of 0.3%. Economists expected a smaller rise of 0.2%. Consumers were more optimistic and made more purchases. October’s core sales, excluding autos, edged up 0.3% from a 0.2% decline in September. Analysts predicted a 0.2% gain in October. Falling gasoline prices helped to increase domestic expenditures leading to stronger holiday sales. Retail sales are expected to gain 0.3% in November while core sales are predicted to rise 0.1 %. US Unemployment claims: Thursday, 13:30. The number of initial claims for unemployment benefits fell back below the 300,000 line last week, indicating continued growth in the labor market. He reading was broadly in line with market forecast. The four-week average increased by 4750 to 299,000 still near post-recession low. However, the sharp decline could be attributed to Thanksgiving holiday. The number of new unemployment claims is expected to be 299,000 this time. US PPI: Friday, 13:30. The producer price index gained 0.2% in October amid a pickup in inflation. Prices for many products increased despite a decline in wholesale gas costs. Automakers contributed to inflation by introducing 2015 car models. Beef prices jumped 6% and pork prices surged 8.1%. Meanwhile, core PPI excluding the volatile categories of food and energy, increased 0.4%. However, the rise in PPI does not reflect a trend, since the ongoing declines in fuel prices boost sales boosting inflation. The producer price index is predicted to fall 0.1% in November. US Prelim UoM Consumer Sentiment: Friday, 14:55. U.S. consumer sentiment edged up in November to a more than seven-year high of 89.4 points, compared to 86.4 posted in September. Economists predicted a reading of 87.3. The ongoing growth in the employment market and the sharp drop in gasoline prices, boosted sentiment. Current economic conditions increased to 103.0 from 98.3 beating forecast of 98.8. Consumer expectations increased to 80.6 from 79.6, exceeding the 80.2 forecast. However, expectations for income gains remained low despite rising and came in below inflation forecasts. One-year inflation expectation declined to 2.6% from 2.9%, while its five-year inflation outlook was also at 2.6%. U.S. consumer sentiment is expected to improve further to 89.6 this time. November payrolls blew forecasts away, but can the rate outlook find more traction at already elevated levels? The US Dollar has dominated the FX market in the second half of 2014. Since mid-year, the Greenback has appreciated against all of its major counterparts with progress ranging from 4.7 to 15.7 percent (USDCAD and USDJPY respectively). This charge finds its bearings in a variety of fundamental currents, but the bulk of this move boils down to the extreme contrast between the benchmarks’ monetary policy and that of its peers. Has the robust November NFPs data catapulted the Dollar to the next leg of its bull run or will a decade-long EURUSD support mix with the year-end liquidity drain to finally stall the currency? 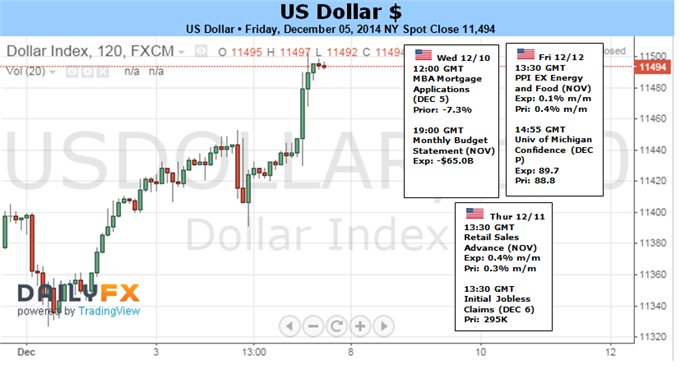 Fundamentals are playing a key role in the Dollar’s drive higher and will be increasingly crucial to momentum ahead. However, even those that ascribe primarily to the economic trends and risk-reward character of money flow must admit to the gravity of the technical picture the currency is displaying. On the one hand, we have benchmarks like the Dow Jones FXCM Dollar Index (ticker = USDollar) which has surpassed the mid-point of its historical range and seems unchecked by historical milestones that could trip up confidence. On the other, we have pairs like EURUSD. The world’s most liquid currency pair stands just above an obvious range floor that has been reversing the market’s bearish fits since November 2003. Such renowned deterrence is not easily overcome. Of the Dollar’s primary motivators, monetary policy is the most active driver; and yet it has excised a lot of the discount that it can afford the unit. Though the Federal Reserve has not raised rates since dropping them to a record low back in December of 2008 nor has it made a move to reduce its stimulus-bloated balance sheet, its bearings are drawing stark contrast to the other major central banks. That said, after ending the QE3 program; a major threshold has been crossed. Meanwhile, the ECB, BoJ and PBoC have recently upgrade their own accommodation efforts and are running short on further options. Perhaps the most dramatic indirect boost the Dollar can realize going forward is an escalation by the European Central Bank to a full-scale stimulus program that shifts appetite further to the US currency. While this upgrade seems likely, the group made it clear they believed the decision would be made in 1Q 2015. If the Dollar stops gaining ground on weakened counterparts, the forecast for its own rate potential looks exaggerated. The FOMC has wavered little in its forecasts for a first hike around mid-2015 and a moderate pace of tightening thereafter. This past week, the November payrolls (adding 321,000-jobs versus 230,000 expected) was a headline-worthy reminder of the United States labor market progress, but it doesn’t do the heavy lifting of moving forward rate hikes – that would be the duty of still-tame inflation. While the market is still running at a discount to the Fed’s forecasts, thecentral bank may soon see its consensus view downgraded at the next meeting (December 17). At the last quarterly meeting with forecast updates (September 17), a 1.38 percent-consensus arose for the end of 2015. That seems unrealistic against the ‘modest pace’ vow intoned by the group. Domestic developments remain largely an afterthought for the Japanese Yen even as the December 14 snap election looms ahead. Polls ahead of the vote suggest Shinzo Abe and his LDP/Komeito coalition will probably retain its two-thirds majority, giving the Prime Minister the mandate he is after. As we discussed two weeks ago, the inherently expansionary nature of “Abenomics” means the markets are unlikely to be perturbed unless the current government looks to be genuinely threatened. As long as the status quo looks firmly set, the whole ordeal will probably pass relatively quietly. This puts the focus to external factors. 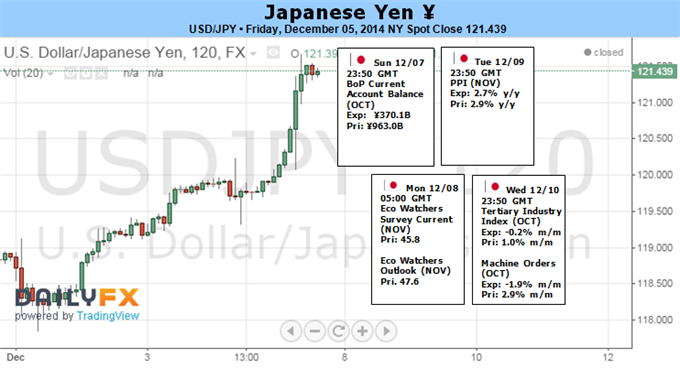 The Yen plunged to a seven-year low against the US Dollar following November’s impressively strong Nonfarm Payrolls print, but the response from risk appetite was suspiciously lackluster. Indeed, the S&P 500 stock index – a benchmark for sentiment trends – was barely changed in Friday’s session. This may be foreshadowing the emergence of year-end capital flows as a formative driver of price action. Risk-taking has been well-supported in the past year but markets would be wise to question the likelihood of more of the same in 2015. While the precise timing of the first post-QE Fed interest rate hike is a matter of some debate, the general likelihood of stimulus withdrawal in the year ahead is increasingly seen as a given. That may drive liquidation of risk-geared exposure ahead of the calendar year turn as market participants move to lock in performance numbers ahead of a more difficult 12-month stretch ahead. For currency markets, such a scenario may take the form of an exodus from carry trades, which a usually funded in terms of the perennially low-yielding Japanese unit. That would imply a wave of short-covering on anti-Yen exposure, pushing prices higher. The extent to which US economic news-flow can alter this dynamic remains unclear. November’s Retail Sales and PPI reports as well as December’s UofM Consumer Confidence gauge are on tap. If these prove strong – fueling Fed tightening bets – another Yen selloff mirroring the markets’ post-NFP reaction may be triggered. Outcomes broadly close to forecasts that do not dramatically disrupt the established policy outlook may yield the spotlight to seasonal forces however. 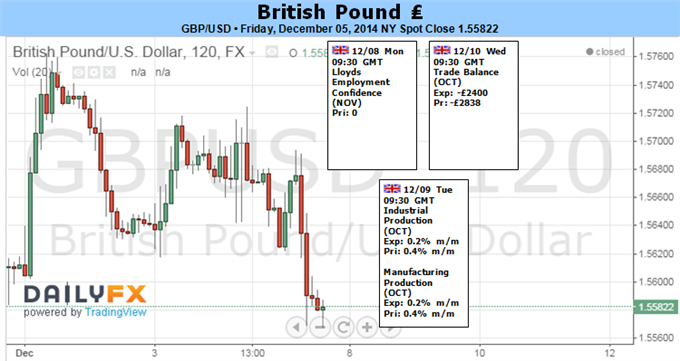 GBP/USD slipped to a fresh monthly low of 1.5568 as U.S. Non-Farm Payrolls marked the largest advance since January 2012, and the pair may continue to track lower in the week ahead should the fundamental developments coming out of the world’s largest economy ramp up bets of seeing the Federal Reserve normalize monetary policy sooner rather than later. In contrast, it seems as though the Bank of England (BoE) Minutes, due out on December 17, will show another 7-2 split within the Monetary Policy Committee (MPC) as the central bank refrained from releasing a policy statement following the December 4 meeting, and the British Pound may continue to underperform against its U.S. counterparts over the near to medium-term as the majority remains in no rush to normalize monetary policy. Nevertheless, the underlying strength in the sterling is likely to be better seen in crosses rates such as GBP/AUD especially as BoE Governor Mark Carney continues to prepare U.K. households and businesses for higher borrowing costs. Beyond the U.K. data prints, MPC members Martin Weale and Ian McCafferty, the two dissenters on the MPC, are schedule to speak in the week ahead, and the fresh batch of BoE rhetoric may heighten the appeal of the British Pound as the central bank hawks continue to push for a rate hike. However, the U.S. data prints due out next week may trump the U.K. event risks as market participants gauge interest rate expectations ahead of the next Federal Reserve interest rate decision on December 17, and the bullish sentiment surrounding the greenback may gather pace going into the end of the year should the developments boost interest rate expectations. With that said, the downside targets for GBP/USD remain favored as price and the Relative Strength Index (RSI) retain the bearish trends from back in July, and another batch of positive data prints out of the U.S. may generate fresh monthly lows in the exchange rate as market participants see the Fed normalizing monetary policy ahead of the BoE. 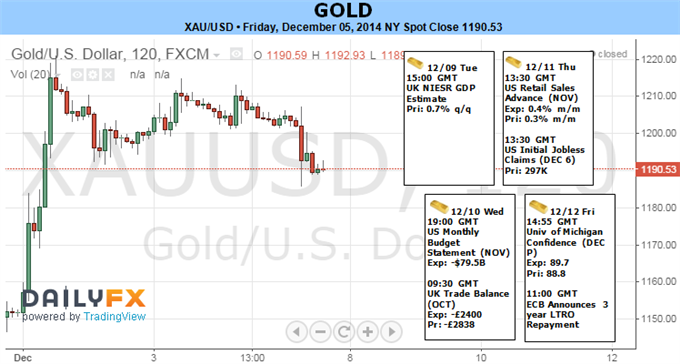 Gold Trading Around Year Open; Bottoming Process? Despite the ‘No’ vote on the Swiss Referendum, Gold prices are higher this week with the yellow metal rallying more than 1.9% to trade at $1189 ahead of the New York close on Friday. Gains early in the week were pared as improving US economic data and persistent strength in the greenback continued to pressure gold lower. Despite the late-week spill however, prices closed higher on the week with bullion looking to end the week just above near-term support. The US Non-Farm Payrolls release on Friday spurred a steep sell-off in gold after the print topped consensus estimates with a blowout read of 321K and an upward revision of last month’s print to 236K. As a result, gold remains vulnerable to U.S. dollar strength on expectations that the Federal Reserve will be looking to move on interest rates amid the improving US economic outlook. Looking ahead to next week, traders will be eyeing US retail sales report and the University of Michigan Confidence survey for further guidance especially ahead of the FOMC interest rate decision on December 17. Another batch of positive U.S. data may heighten the bullish sentiment surrounding the greenback, which could continue to cap the near-term advance in bullion. From a technical standpoint, Monday’s rally into $1220 completed a 100% extension off the November low and we’ll maintain more neutral stance heading into next week while noting a medium-term constructive outlook while above $1175/80. A move below this threshold leaves the trade vulnerable with subsequent support targets seen at $1165 and the December opening range low at 1142. A breach of the highs eyes objectives at $1237, $1248 and key resistance at $1262/68. The Nikkei as you can see rose during the course of the week, breaking well above the ¥17,500 level. The market looks like it’s ready to continue going much higher, and we feel that pullbacks will continue to be buying opportunities. This market is most certainly bullish, but there’s no way whatsoever that we would sell a market that has been bullish, and as a result this is “buy only.” We believe that this market will then head to the ¥20,000 level given enough time, but ultimately we will buy every time it dips. The DAX initially fell during the course of the week, but then shot well above the 10,000 level in order to continue the bullish trend that we have seen for some time. With that, we feel that pullbacks offer buying opportunities, just as a break above the top of the range for the week does. The €10,000 level should now be rather supportive, and as a result we feel that as long as the market stays above there, it’s impossible to sell this market as it has been so strong. The NASDAQ as you can see fell during the course of the sessions for the week, but found a significant amount of support at the 4725 level. The bounce caused a hammer, which of course is showing that there is significant support below, and we should see this market go higher given enough time. The jobs number was better than anticipated on Friday, so that being the case it appears of the market is eventually going into 5000 level. Pullbacks are considered to be value, so as a result we are very bullish. The S&P 500 initially fell during the course of the week, but found enough support near the 2050 level to turn things back around and form a hammer. Ultimately, we believe that this market should continue to go higher if we can break above the top of that hammer, as we should then go to the 2100 level, followed by the 2200 level. The 2000 level should continue to be supportive as it was once the resistance that the markets fight so hard against. We are very bullish and the S&P 500, and will continue to be. The US Dollar Index initially fell during the course of the week, but found enough buying pressure underneath the 80 handle to turn things back around and form a very positive looking candle. With that, it appears that the market will continue to go higher even though it is massively parabolic at this point in time. After all, we started this move at the 80 handle, and we are now approaching the 90 handle over the course of just a few months. We believe the pullbacks will continue to be buying opportunities, but quite frankly it seems almost an afterthought that we are going to head to the 90 handle next. That being the case, you can go back and forth between this market and the spot Forex in order to take advantage of obvious US dollar bullishness. It makes sense, as the Federal Reserve has left quantitative easing while the rest of the world has been trying to figure out how to bring down the value of their own currencies anyway. The EUR/USD pair is the biggest component of this index, and the fact that it continues to struggle, it makes sense of this market continues to go higher. Ultimately, we believe that the European Central Bank is probably going to continue to loosen its monetary policy, and that of course gives is the ability to have faith in the US dollar overall. Nonetheless, there are plenty of currencies that you can sell against the US dollar if you are not willing to step into the futures market, as this is a great harbinger of what you can see in the spot market. Especially vulnerable will be commodity currencies going forward, such as the New Zealand dollar, the Australian dollar, and the Norwegian krone. With that being the case, we feel that the US dollar is going to continue to reign supreme in the near term, and that any pullback in this marketplace should be looked at as potential value, not only in this contract, but in the spot Forex market as well.